Episode 83 - The brothers learn of the massacre of their sons & allies, and summon Draupadi to break the news. As usual, all she wants is revenge. 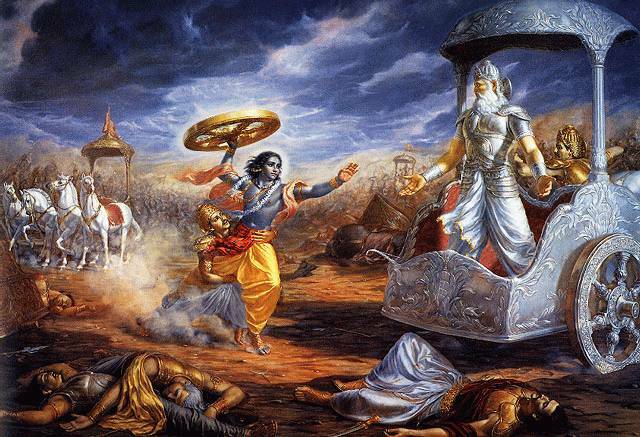 Thus the Pandavas go off on one final mission to avenge the death of their sons. They track down Ashwatthaman and find him hanging out with Vyasa and Narada. As soon as they set eyes on each other, the boy Brahmin sets off his Brahmashira weapon, which is 100s of times more powerful than the Brahmastra, and sounds a lot like a hydrogen bomb-- "All living things are destroyed and no rains fall for 12 years." The Rishis step in and order Arjun to put his guns away, but Ashwatthaman cannot retract this weapon once it is unleashed, so instead, he turns it loose on the wombs of the Pandava women, making them sterile and killing their one remaining heir-- Uttara's unborn son Parikshit. Fortunately, Krishna revives the kid, but there shall be no more Pandava offspring after this. To help explain how Ashwatthaman was able to pull off this massacre single-handedly, Krishna tells a few stories about Shiva, and just how temperamental and dangerous he can be. In fact, Shiva really comes off as more of a force of nature than a Saddhu living in the hills. My guess is, that if we understood the physics of Time, we might realize that Shiva stands in for one of the main functions of time, which is change. The other aspects of time are novelty (Brahma), and the moment of Now, which I believe is represented by Vishnu. I was just rewatching Sita Sings the Blues, it occurred to me that Ravana didn't do anything wrong according to the Dharma of a kshatriya or at least not much. He had great spiritual power and he kidnapped a woman of his caste to marry her. He didn't force himself on her. It's true that he should have fought rama for her, but he must surely have felt justified if the kind of reasoning used for justification in the Mahabharata is applied to his case. He wants her and can't think of a way to get her without trickery. It makes me wonder about the moral message of the Ramayana even more than the Mahabharata. Any thoughts? I'm so deep in the rules of morality in the Mahabharata that I can tell you what makes Ravana a bad guy-- on two counts. The first is not that he stole Rama's wife, but that he failed to first vanquish Rama. We saw that in the abduction of Draudpadi-- Jayadratha was criticized only for failing to first kill the Pandavas. Apparently it was otherwise OK to steal her. But we know that sometimes the rules are meant to be broken, and that for a good cause, one may break the rules and still be considered righteous. The distinction is very subtle-- it's OK to break the rules if you are good, but not OK if you are bad. And Ravana is bad. That's just a fact. Therefore he has no excuse for breaking the rules. Thanks for staying with me so long!